Congenital skeletal malformations represent a heterogeneous group of disorders affecting bone and cartilage development. In cattle, particular chondrodysplastic forms have been identified in several miniature breeds. In this study, a phenotypic characterization was performed of an affected Miniature Zebu calf using computed tomography, necropsy and histopathological examinations, whole genome sequencing of the case and its parents on an Illumina NextSeq 500 in 2 × 150 bp paired-end mode and validation using Sanger sequencing and a Kompetitive Allele Specific PCR assay. Samples from the family of an affected Miniature Zebu with bulldog syndrome including parents and siblings, 42 healthy Miniature Zebu not related with members of the herd and 88 individuals from eight different taurine cattle breeds were available for validation. A bulldog-like Miniature Zebu calf showing a large bulging head, a short and compressed body and extremely short and stocky limbs was delivered after a fetotomy. Computed tomography and necropsy revealed severe craniofacial abnormalities including a shortening of the ventral nasal conchae, a cleft hard palate, rotated limbs as well as malformed and fused vertebrae and ribs. Histopathologic examination showed a disorganization of the physeal cartilage with disorderly arranged chondrocytes in columns and a multifocal closed epiphyseal plate. Whole-genome sequencing of this malformed Miniature Zebu calf, its dam and sire and subsequent comparative sequence analysis revealed a one base pair insertion (ACAN:c.5686insC) located within the cartilage development gene aggrecan (ACAN) exclusively homozygous in the affected calf and heterozygous in its parents. This variant was predicted to cause a frameshift (p.Val1898fsTer9) and thus a truncation of the chondroitin sulfate domain as well as a loss of the C-terminal globular domain of ACAN. It perfectly co-segregated with the lethal bulldog syndrome in Miniature Zebus. We found a novel mutation in ACAN causing a recessive lethal chondrodysplasia in Miniature Zebu cattle. A diagnostic test for this mutation is now available for Miniature Zebu breeders preventing further cases of bulldog syndrome by targeted matings. To the authors’ best knowledge, this is the first case of a Miniature Zebu associated with an ACAN mutation. Chondrodysplasias are congenital malformations first described in cattle in the early twentieth century . 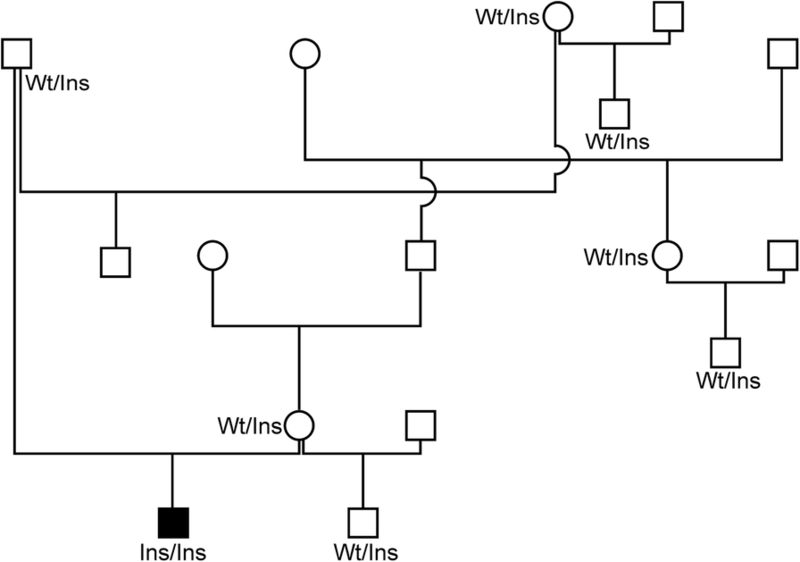 Generalized chondrodysplasias in domestic animals were designated as bulldog syndrome . Characteristics of the bulldog syndrome are a premature termination of metaphyseal bone growth due to a disturbed endochondral ossification leading to a shortening of cranial base of the head and spine, a premature fusion of the spheno-occipital joint, a limited length growth of the tubular bones and consequent constriction and contraction of the limbs [3–5]. A disturbed endochondral ossification in bulldog calves primarily affects the growth of the long bones . Bulldog calves exhibit micromelia, short spine, large abdomen, and a relatively large head. The head shows a shortened nose, cleft palate and a protruding tongue [7, 8]. This anomaly has been observed in several cattle breeds including Dexter [1, 3], Holstein Friesian [9–12], Miniature Scottish Highland [8, 13, 14], Miniature Belted Galloway , Nellore , Charolais x Salers crosses  and in Nganda cattle, a small Zebu crossbred . The mode of inheritance for the bulldog syndrome in Dexter cattle was proposed to be incomplete dominant with a lethal bulldog phenotype in a homozygous state and without abnormalities but shorter legs in a heterozygous state [7, 17]. Breeders of Dexter cattle observed more often calves, which were aborted before the seventh month of pregnancy with an extremely marked and constant type of deformity of the body . Two mutations were identified in the aggrecan (ACAN) gene on bovine chromosome (BTA) 21 for the Dexter bulldog phenotype. An insertion in exon 11 (BD1) and a second variant in exon 1 (BD2) were identified in bulldog affected Dexter calves . The BD1 mutation was also found in bulldog phenotypes of Miniature Scottish Highland and Miniature Belted Galloway [8, 13]. In these breeds potentially derived from intermixes with Dexter cattle, the mode of inheritance was also suggested to be incomplete dominant . Very similar bulldog phenotypes caused by COL2A1 mutations were found in Holstein Friesian cattle. Four different missense mutations in the COL2A1 gene on BTA 5 were reported where each one is responsible for bulldog syndrome in Holstein calves [9–12]. 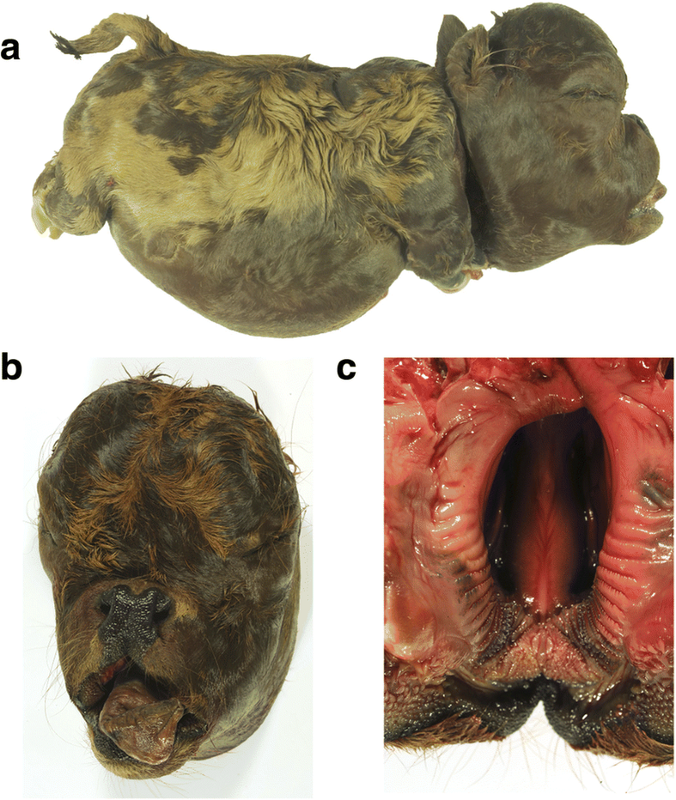 Affected Holstein Friesian calves showed typical malformations of the bulldog phenotype. These included the shortened legs, brachygnathia superior, shortening and compressed body, malformed vertebrae, shortening of the vertebral column and palatoschisis [9, 11, 18]. A further missense mutation in COL2A1 was found in crossbred calves from a Charolais bull and Salers dams with a similar bulldog phenotype . In the present study, we demonstrate a bulldog phenotype in a Miniature Zebu and analyze WGS data of a bulldog calf and its parents in order to identify the potential causal mutation. The head of the affected calf was in relation to its body very large and bulge, whereas the body of the calf appeared short and compressed (Fig. 1a). In addition, the limbs were shortened and stocky, but the phalanges showed normal size. In contrast, the two investigated parents of the affected calf did not show any bone abnormalities. The neck and the spine of the calf were shortened. The buttocks appeared to have an increased muscular mass, which led to dorsocranially-displaced tail. The body showed a fully developed coat, the skin was not wrinkled and abdominal wall was closed. Various craniofacial anomalies were seen including a shortening of the skull base and a bulge forehead (Fig. 1a, b). Furthermore, the calf showed brachygnathia superior, the nose was depressed and the upper jaw shortened in relation to the lower jaw. The bridge of the nose was bent inwards and the upper lip showed a notch (Fig. 1c). In addition, the teeth were spiky, while the prolonged, fleshy tongue protruded from the mouth and was rolled in. The ears were dislocated to a caudal position. The CT scan in the lateral view of the head confirmed a shortening of the nose region and a bulging forehead (Fig. 2a). The shape of the forehead was a result of an expansion of the frontal, parietal and occipital bones, which made the neurocranium very prominent and gave the head a spherical appearance. In addition, the head in the lateral view showed brachygnathia superior, prognathism, a notch in the area of the nose and eye sockets that were located caudodorsally. In the craniocaudal view of the skull, a shortening of the ventral nasal conchae and a cleft hard palate was visible. In the dorsoventral view of the body a significant shortening of the vertebral column was found, whereby the number of vertebral bodies was in the normal range with seven cervical vertebrae, thirteen thoracic vertebrae, six lumbar vertebrae, five sacral vertebrae and seven coccygeal vertebrae (Fig. 2b). However, the first ten thoracic vertebrae were fused in the dorsoventral view, and the first ten ribs were partially fused together. The shape of the vertebrae was variable, the spinous processes were not developed over the entire length and transverse processes of the lumbar spine were only rudimentary. A number of the vertebrae bodies had a major failure of the fusion of the right and left dorsal parts. The ribs were shortened, irregularly shaped and had a variable distance from each other. In the latero-lateral view an unusual arrangement of the ribs was obvious. They were arranged rather horizontally instead of vertically. The limbs also showed severe malformations. The long bones were significantly shortened and irregularly shaped. The diaphysis of the long bones were mineralized, but not the epiphyses, which resulted in an extremely wide region of radiopaque material between the individual long bones in CT images. The pelvis was underdeveloped, which made it look small and burly. In addition, the scapula, like the pelvis, showed a developmental delay, which made its appearance small and burly. At post mortem examination the bulldog Miniature Zebu calf showed a crown-rump length of 24 cm (9.45 in.) and a body weight of 4.3 kg. The head of the calf was enlarged and dome-shaped with protruded mandible and tongue. A cleft lip and palate was present (Fig. 1c). The splanchnocranium was shortened and deformed. Furthermore, the calf had a shortened vertebral column with reduced sizes of individual vertebrae, a deformed thorax with shortened ribs, as well as shortened and rotated limbs. Findings in other organs included diffuse subcutaneous edema (anasarca) and total lung atelectasis. Histologically, malformed humerus, femur, tarsal, metatarsal, and metacarpal bones as well as cervical vertebrae showed a disorganization of the physeal cartilage with irregular arrangement of chondrocytes, characteristic of chrondrodysplasia (Additional file 1). The epiphyseal plate was sealed multifocally by deposition of osteoid. In other organs no significant findings were present. By means of cultural examination bovine virus diarrhoe virus-infection was excluded. In total, 154,417,677 (bulldog calf), 195,556,794 (dam) and 159,320,369 (sire) reads were mapped to the reference genome UMD 3.1. Aligned data had a mean coverage of 8.4X (bulldog calf), 10.7X (dam) and 8.7X (sire) in the bulldog Miniature Zebu family. Based on 33,367,047 called and quality controlled SNPs and 4,415,382 indels, filtering analysis was performed for homozygous mutant genotypes exclusively present in the affected bulldog calf. This analysis resulted in one frameshift and seven missense variants (Additional file 2). After comparison of genes from filtering results with candidate genes known to play a role in chondrodysplasia, dwarfism, growth retardation, proportionate dwarfism and inherited congenital skeletal malformations, only two variants were identified in the candidate gene list located in ACAN (ACAN:g.20850999insC) and PKD1 (PKD1:g.1643626C > T) (Additional file 3). Sanger sequencing confirmed the candidate variant ACAN:g.20850999insC in exon 12 of ACAN (Additional file 4). The affected Miniature Zebu was found to be homozygous for the mutant allele of ACAN whereas the dam and sire were heterozygous (Fig. 3). The variant PKD1:g.1643626C > T designated as homozygous mutant in WGS data was shown to be heterozygous in the affected calf and its sire and therefore was excluded as candidate variant (Additional file 5). Further genotyping of the ACAN variant in controls showed that the homozygous mutant variant was not present in any other tested individuals (Table 1, Fig. 4). Controls were 88 individuals from eight different taurine cattle breeds, 42 healthy Miniature Zebu not related with members of the herd with the bulldog calf and further five Miniature Zebus from the herd with the proband. The insertion of one base pair (ACAN:c.5686insC) is predicted to cause a frameshift (p.Val1898fsTer9) and subsequently a premature stop codon in exon 12. A predicted sequence similarity of 99.53% was found for zebu cattle protein (XP_019838757.1) with cattle protein transcript 202 (ENSBTAP00000021514). Both amino acid (aa) sequences were proposed to be truncated by 423 aa (Additional file 6). Open reading frame finder tool (https://www.ncbi.nlm.nih.gov) suggested the premature stop codon at aa position 1906, whereas wild type ACAN revealed a product size of 2328 aa. This frameshift is predicted to result in a shortened chondroitin sulfate domain and a loss of the C-terminal globular domain 3 (Additional file 7). This is the first study describing a novel variant in ACAN for chondrodysplasia in Miniature Zebus. 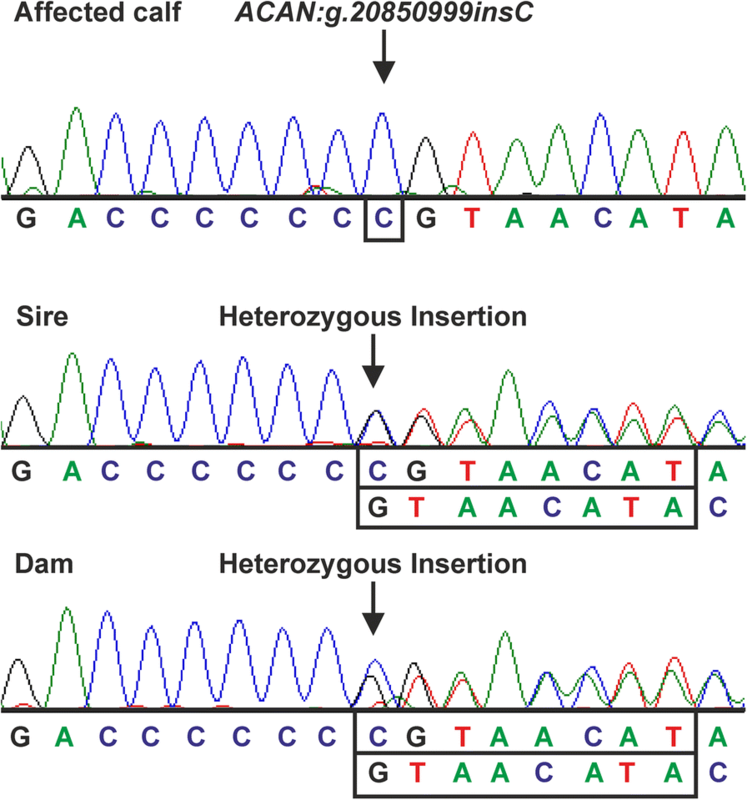 Whole genome sequencing data enabled the detection of a homozygous frameshift mutation in an affected calf validated through Sanger sequencing. Thus, validation confirmed NGS data with an average coverage of 8.4X of the affected calf. Even in the first phase of the 1000 bull genomes project with an average coverage of 8.3X a heterozygous causative variant for lethal chondrodysplasia was identified . In addition, the high number of control samples facilitated the exclusion of false positive results for chondrodysplasia-associated variants. The clinical phenotype of chondrodysplastic Zebu cattle has already been observed in Nganda and Nellore cattle [15, 16]. The clinical findings of these cases were similar to those identified in the Miniature Zebu investigated in this work. Phenotypic characteristics in the affected Miniature Zebu were typical for bulldog syndrome, similar to those previously described in Dexter [1, 3, 7], Holstein Friesian [9, 11, 19], Miniature Scottish Highland [8, 13] and Miniature belted Galloways  due to generalized chondrodysplasia. Only two genes, ACAN  and COL2A1 [9–12], were so far identified harboring causative variants for these bulldog types. Variants in ACAN were detected in exon 1 (BD2) and exon 11 (BD1) in Dexter , Miniature Scottish Highland [8, 13] and Miniature Belted Galloway . The BD variants lead to different shortenings of a keratan sulfate domain. BD1 leads to a complete loss of the chondroitin sulfate domain and the globular domain, whereas BD2 causes a shift of the open reading frame and produces a shortened protein of unknown function . It is a striking feature that all these bulldog calves caused by mutant ACAN variants were from miniature cattle breeds. These results suggest that bulldog syndromes associated with ACAN variants are specific for miniature cattle breeds. Aggrecan proteoglycan is an important component of the extracellular matrix in the articular cartilage . ACAN which is located in the extracellular matrix can form a hydrated gel affecting chondrocyte-chondrocyte and chondrocyte-matrix interactions . Proteoglycan mutation were proposed to disturb chondrocyte column formation and demarcation of proliferative and hypertrophic zones of epiphyseal cartilage . This results in defects of differentiation and maintenance of the skeletal elements . Due to the fact that ACAN is the primary proteoglycan component of the extracellular matrix of cartilage growth plate and other cartilaginous tissues , ACAN variants were also found to be associated with genetic skeletal diseases in other species like chicken [24, 25], mouse [26, 27], human  and horse . A characteristic finding in humans was a short stature. The seven known variants in ACAN [6, 23, 29–32], which are responsible for this short stature in human are in different exons, but there are two mutations in exon 12. All variants have in common that they produce a truncated protein due to a premature stop codon. In three variants, the premature stop codon was located in the C-type lectin domain located within the G3 domain [23, 30, 31]. In other cases, the stop codon was located proximal to the G1 and G2 , CS-1  and CS-2 domain . Aggrecanopathies in other mammalian species have been shown to be perinatally or embryonically lethal in a homozygous state [17, 26, 28, 33, 34]. Furthermore, all affected individuals had short limbs and were thus, affected by disproportionate dwarfism [26, 28, 33–35]. The histological changes seen in the shortened legs of affected calves are due to a disturbance of endochondral ossification . Disturbances of the endochondral ossification caused by ACAN mutations may lead to genetic skeletal diseases . In animals, different exons of ACAN are affected by ACAN mutations [26, 34]. However, all variants of ACAN lead to shortened proteins due to a premature stop codon at different positions. An ACAN variant in the horse was found to affect the C-lectin domain . However, it can be assumed that this, as in humans, is analogous to the G3 domain . The truncated protein in nanomelia is retained and accumulated in small cytoplasmic structures corresponding to extensions of the endoplasmic reticulum (ER) . For this reason, chondrocytes of chicken affected by nanomelia do not contain the mutant aggrecan protein in cartilage extracellular matrix (ECM). In the Cmd-affected mouse, the truncated aggrecan protein was not detected in the endoplasmic reticulum and was consequently missing in the ECM . These findings demonstrated that the reduction or absence of ACAN in the ECM is causing the chondrodysplasia phenotype . Further studies are required to establish whether the truncated protein is synthesized and has an effect on other proteins within the endoplasmic reticulum and on chondrocyte function. Based on the results in mouse and human and histopathological findings in the present bulldog case, we suppose that the potential causal mutation in ACAN identified in this study on a bulldog Miniature Zebu leads to a truncated transcript and the resulting truncated protein might accumulate in the endoplasmic reticulum causing severe generalized bone malformations. In the present study, we found a novel mutation in ACAN resulting in a recessive lethal chondrodysplasia in Miniature Zebu cattle. This is the first study on Bos indicus, which successfully used whole genome sequencing for the identification of a causal chondrodysplasia variant. A diagnostic test for this mutation is now available for Miniature Zebu breeders preventing further cases of bulldog in Miniature Zebu by targeted matings. In total, 50 samples from privately owned Miniature Zebu samples were collected at five farms performing non-commercial breeding in Germany. The samples per herd comprised 3, 8, 10, 13 and 16 animals. The genomic DNA of 50 Miniature Zebu and further 88 individuals from different European cattle breeds as controls was isolated from EDTA-blood, hair root or tissue samples. In total eight Miniature Zebus (parents, affected calf and five relatives) were sampled from the herd where the affected Miniature Zebu was born. The other 42 samples of Miniature Zebus came from herds where no cases of bulldog calves have been observed to date. The 88 samples from other breeds included Salers, Angus, Blonde d’Aquitaine, Brown Swiss, Charolais, Holstein Friesian, Fleckvieh and Limousin. Veterinarians under avoiding any unnecessary pain to animals did sampling in this investigation. During this experiment, no animals died or had to be euthanized. A Miniature Zebu cow has given birth to a male calf after a gestation length of 7 months. At birth, this male calf was already dead. Due to a severe malformed head, a fetotomy had to be performed by the veterinary practitioner. The head was dissected from the body in order to save the life of the dam. The head and the body of the bulldog Miniature Zebu underwent a computed tomography (CT) scan in sternal recumbency using a multislice helical CT scanner (Brilliance-™-CT BigBore Oncology, Philips Medical Systems, Best, The Netherlands). A slice thickness for the head of 1 mm and settings of 120 kV/ 300 mAs and for the body a slice thickness of 2 mm and settings of 140 kV/ 300 mAs were set for analysis. A 512 × 512 matrix was used. A full necropsy of the bulldog Miniature Zebu calf was carried out. Samples from long bones (humerus, radius, metatarsal, metacarpal bones), including articular cartilage, epiphysis, epiphyseal plate, metaphysis and diaphysis, as well as tarsus and cervical vertebrae were fixed in 10% formalin for 48 h, followed by decalcification in HNO3 solution (5%) for 24 h. Afterwards, tissue samples were embedded in paraffin and 4 μm thick paraffin sections were cut and stained with hematoxylin and eosin (HE) for histological examination. Photographs were taken with a light microscope (Olympus BX51, Olympus, Hamburg, Germany) with an Olympus camera DP72 and Olympus cellSense software. To identify a potential causal variant for bulldog in Miniature Zebu, genomic DNA from EDTA-blood samples of the sire and the dam and tissue from the affected calf was extracted using a standard salting out procedure with chloroform. Libraries were prepared and quality controlled according to standard protocols using the NEBNext Ultra DNA Library Prep Kit for Illumina (New England BioLabs, Ipswich, MA, USA). Libraries were run on an Illumina NextSeq500 in a 2 × 150 bp in paired-end mode. Quality control was performed using fastqc 0.11.5  and reads were trimmed using PRINSEQ (V 0.20.4) . WGS data of the bulldog calf, sire and dam were deposited in NCBI Sequence Read Archive (http://www.ncbi.nlm.nih.gov/sra) under SRA accession number SRP132671 (PRJNA433787). After quality control mapping was performed to the bovine reference genome UMD 3.1. (Ensembl) using BWA 0.7.13 . Bam-files were sorted and indexed using SAMtools 1.3.1  and duplicates were marked using Picard tools (http://broadinstitute.github.io/picard/, version 2.9.4). In a further step, GATK version 4.0  including Base Quality Score Recalibration (BQSR), Haplotype Caller and Variant Recalibrator were used for variant calling. These data of the affected calf, dam and sire were compared with WGS data of 51 different individuals from the breeds Holstein, German Brown, Charolais, Hereford, Limousin, Tyrolean Grey and Vorderwald . For further analyses, variants with a read depth of 2–999 and quality score values > 20 were selected. We filtered out variants, which were homozygous mutant for the bulldog Miniature Zebu, but not homozygous mutant in the sire and dam and homozygous wild type in all other animals using SAS, version 9.4 (Statistical Analysis System, Cary, NC, USA). Variants flagged with annotation accuracy warnings were omitted. Finally, only those variants with high or moderate effects according to prediction toolbox SNPEff version 4.3 q (2017-08-30, SNPEff database UMD3.1.86)  were chosen for further inspection. Variant effect prediction was performed using the Variant Effect Predictor  based on UMD 3.1 assembly for SIFT  predictions. A candidate gene list for the terms chondrodysplasia, dwarfism, growth retardation, proportionate dwarfism and inherited congenital skeletal malformations was prepared using NCBI Gene database and supplemented with further genes identified in previous studies [9, 11]. For validation of detected mutant candidate variants, Sanger sequencing was performed for exon 12 of ACAN and for exon 15 in PKD1 in the affected Miniature Zebu, dam, sire and three further individuals. A sample of muscle tissue from the affected calf, EDTA-blood from sire and dam as well as hair samples from the other three individuals from the affected herd were available for DNA isolation. For DNA isolation a standard saline precipitation method was performed . Primer3 tool (version 0.4.0, http://bioinfo.ut.ee/primer3-0.4.0/) was applied for primer design (Additional file 8). For DNA derived from hair samples, a second primer pair was used for an additional PCR on the already obtained PCR-product to increase the specificity of reactions. PCRs were performed in 22-μl reaction volumes containing 2 μl DNA, 1.5 mM deoxyribonucleoside triphosphates, 5 pmol of each primer, 1.5 U of Taq polymerase in the reaction buffer supplied by the manufacturer (MP Biomedicals, Eschwege, Germany) and with enhancer reagent (Qiagen, Hilden, Germany) for optimizing reaction conditions. After a 5 min initial denaturation at 95 °C, 42 cycles of 30 s at 94 °C, 30 s at 58 °C, and 45 s at 72 °C was run on a Thermocycler TProfessional 96 (Biometra, Göttingen, Germany). PCR products were sequenced on Applied Biosystems 3500 Series Genetic Analyzer (Thermo Fisher Scientific, Waltham, MA, USA). Sequence data were analysed using Sequencher 4.8 (Genes Codes, Ann Arbor, MI, USA). In addition, the Miniature Zebu bulldog associated variant in exon 12 of ACAN was genotyped in the affected calf, sire, dam, five other individuals of the affected herd and further 42 healthy Miniature Zebu and 88 individuals from taurine breeds including Salers, Angus, Blonde d’Aquitaine, Braunvieh, Charolais, Holstein Friesian, Fleckvieh, Limousin using a Kompetitive Allele Specific PCR (KASP) assay (LGC Genomics, Middlesex, UK; He et al., 2014). KASP reaction was performed using 5 μl KASP Master Mix 2× (LGC Genomics), 0.14 μl KASP Assay mix (two allele-specific primers, one common primer designed by LGC) and 5 μl template DNA with a concentration of 10 ng/μl and run on an ABI7300 real-time system for 96 well plates (Additional file 9). In addition, ACAN transcripts found in zebu and cattle were investigated for predicted open reading frames using ORFfinder (NCBI, https://www.ncbi.nlm.nih.gov) and compared with each other using Clustal Omega . Predicted protein domains were identified using UniProdKB database (P13608_BOVIN)  and data from a previous study . The variant ACAN:g.20850999insC was submitted to European Variant Archive (PRJEB24930). The authors are grateful to the Miniature Zebu breeders donating samples and providing data for this research project. We thank J. Wrede for his help in bioinformatics and M. Drabert, H. Klippert-Hasberg and N. Wagner for support in DNA preparation. We thank H. Klippert-Hasberg for expert technical assistance in library preparation and next generation sequencing. We gratefully acknowledge The North-German Supercomputing Alliance (HLRN) for providing high performance computing infrastructure and resources. WGS data of the bulldog calf, sire and dam were deposited in NCBI Sequence Read Archive (http://www.ncbi.nlm.nih.gov/sra) under SRA accession number SRP132671 (PRJNA433787). Conceived and designed the experiments: AKS, JM and OD. Performed the experiments: AKS, CD, MB, AW, AB, MH and JM. Analyzed the data: AKS, JM and OD. Contributed reagents/materials/analysis tools: AKS, BO, MH, AW and AB. Wrote the manuscript: AKS, JM and OD. Final approval of the version to be published: AKS, CD, MB, MH, AW, BO, AB, JM and OD. All authors read and approved the final manuscript. All animal work has been conducted according to the national and international guidelines for animal welfare. The present study had been specifically approved by the Institutional Animal Care and Use Committee (IACUC), the Lower Saxony state veterinary office at the Niedersächsisches Landesamt für Verbraucherschutz und Lebensmittelsicherheit, Oldenburg, Germany (registration number 04A 247/509c-42,502-02A99). We obtained written informed consent from the owners of Miniature Zebus to use samples from their animals in the present study. Samples of controls from other breeds were taken from our biobank and all the owners of these animals gave written informed consent to use these samples. Andrews S: FastQC: A quality control tool for high throughput sequence data. In: Reference Source. http://www.bioinformatics.babraham.ac.uk/projects/fastqc/; 2010.